By eliminating the external SAN, Pivot3 dramatically simplifies the UCS Mini platform into a compact, easy- to-manage, data center in a box solution. The Cisco Unified Computing System (UCS) Mini is a transformative solution for meeting the demands of modern data center challenges. Optimized for small-to-medium-sized (SMB) business, and remote office and branch office (ROBO) implementations, the UCS Mini optimizes your data center strategy for Tier One applications, delivering server, storage, and networking in an easy-to-deploy, compact form factor. In order to meet a broader spectrum of business services, UCS Mini has almost always required the use of an external storage area network (SAN), and its accompanying cost and complexity. Until now. Dynamic Hypercovergence provider Pivot3, in partnership with Cisco, removes that cost and complexity of maintaining an external SAN and consequently reduces the costs associated with rack space, power, cooling, and administrative resources while significantly reducing your data center footprint by up to 54%. By unifying the compute and storage resources contained in each UCS Mini blade, Pivot3 and Cisco deliver a simplified, self-contained and unified platform designed for efficiency, resiliency, and game-changing performance. Pivot3’s patented operating system maximizes and optimizes usable storage capacity and unifies the resources of individual server blades in an aggregated pool of shared CPU, Cache, and Memory. The Pivot3-powered UCS Mini platform is seamlessly managed through an intuitive, self-monitoring, self-managing user interface. Together, Pivot3 and Cisco deliver a modular computing fabric that unifies storage, compute, network and virtualization integrated into a single architecture. The result is a harmonized platform that increases agility to non-disruptively scale capacity and performance on the fly as your organizational needs expand. The combined solution automates deployment and orchestration capabilities of both Pivot3 and Cisco via UCS Director to simplify management, making both remote and centralized IT staff more efficient. The combined solution meets the highest customer standards of performance and data protection with the assurance that your IT infrastructure will operate at peak levels, during load, stress and failure. Cisco UCS Mini, powered by Pivot3, maximizes the use of existing resources, accelerates time-to-value and streamlines operations so your IT staff can deploy, manage, and globally protect your business services with an optimized experience at an affordable price. UCS Mini becomes a self-contained data center with fabric interconnect, enterprise storage and compute all in one chassis – with no external storage required. Scale-out for compute, performance and capacity for up to 16 servers and 40TB of usable storage, all centrally managed by Cisco UCS software for multi-site remote management. High performance and efficiency is ensured by combining the resources of an individual blade into an aggregated pool of CPU, cache, memory and storage. Eliminates downtime and risk associated with data loss with built-in server failover, fault tolerance based on Pivot3 patented erasure coding, predictive sparing and preventative maintenance. Optimize the data center by unifying compute and storage for your small to medium-sized business or for remote office requirements. Cisco UCS Mini, powered by Pivot3 delivers a total virtualized IT infrastructure solution that unlocks enterprise capabilities in a small, efficient form factor. By adopting a modular, building-block approach through unifying compute, fabric, storage, and virtualization in a single architecture, your organization can rapidly scale deployments and increase responsiveness to line of business requests as needs grow. SMBs typically need fewer servers than large businesses. Many have few or no full-time IT staff members. With aCisco UCS Mini and Pivot3 Hyperconverged solution, SMBs can have an easy-to-manage solution that can growas business grows. Because the solution is easy to deploy and manage and does not require an external SAN,you can spend more time running your business and less time worrying about maintenance and upgrades.Less Complexity = Greater Agility. Managed Service Providers and Internal IT Service Providers require a resilient, modular and high performance infrastructure solution that is rapid to deploy, easy to manage and minimizes external complexity. Pivot3 optimizes the UCS Mini into a tightly-coupled platform, eliminating the complexity and cost of an external SAN, meeting the needs of Internal IT, Managed Service Providers and Small to Large Enterprises. Remote and branch offices are often challenged by having limited onsite IT operations staff, need solutions that don’t rely on specialized on-site IT personnel, and work within limited space. A Pivot3 enabled Cisco UCSMini Hyperconverged solution offers an efficient, cost effective solution for IT infrastructure in a Remote/BranchOffice and Retail setting, one that is easily remotely managed and reduces CAPEX and OPEX and enhances the continuity of business operations while reducing the cost and complexity. A Pivot3 and UCS Mini Hyperconverged solution enables enterprise clients to create denser footprints through combining compute, storage and networking fabric into a modular and scalable footprint. This proven architecture enables a highly performant and efficient storage platform to meet any and all workload requests. Many clients also need remote data centers for meeting legislative and data residency requirements. The Pivot3/Cisco platform is an ideal, rapid to deploy platform. Blade Server harnesses the power of the Intel Xeon processor E5-2600 v2 product family, up to 768 GB of RAM, two hard drives, and 10 Gigabit Ethernet to deliver exceptional levels of performance, memory expandability, and I/O throughput for nearly all applications. 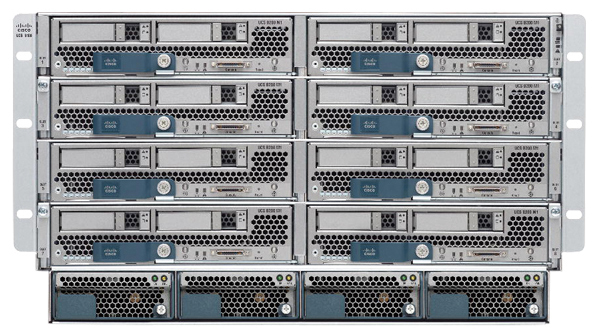 The blade server chassis for the Cisco UCS Mini can accommodate up to eight half-width Cisco UCS B200 M4 Blade Servers. This fabric interconnect provides the same unified server and networking capabilities as the top-of-rack Cisco UCS 6200 Series Fabric Interconnects. The Cisco UCS 6324 Fabric Interconnect embeds the connectivity within the Cisco UCS 5108 Blade Server Chassis to provide a domain of up to 15 servers: 8 blade servers and up to 7 direct-connect rack servers. Provides unified, embedded management of all software and hardware components in a Cisco UCS Mini solution. It offers an intuitive GUI, a command-line interface (CLI), and a robust API to manage all system configuration and operations. Pivot3’s patented vSTAC OS, built on a foundation of VMware vSphere 6.0, unifies compute and storage within a hyperconverged platform. 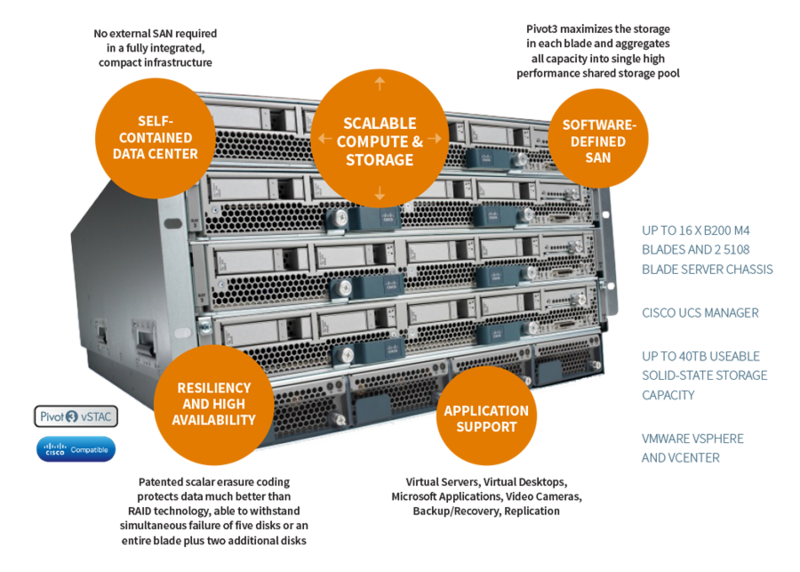 Pivot3 on Cisco UCS enables market leading storage efficiency, increasing the usable storage of a traditional SAN’s 65% with up to 84% usable installed capacity.